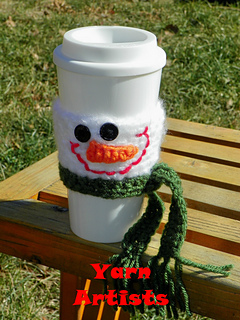 This cup cozy is quick and easy to make. All basic stitches are used. I would consider this pattern level to be EASY. You will need an 11.5 oz plastic cup. Small amount of red, orange and green worsted weight yarn. Please post a picture of you completed project. I love to see them. Feel free to sell any items made from my patterns. Correction: After you finish the snowman body, fasten off and weave in ends. The scarf starts with a chain 15, then it is attached to the snowman body with a slip stitch.